WHAT? : Some friends & acquaintances have organised a Walk. Now they must gather friends, high-profile supporters and politicians to join the walk........and they need your help. WHEN? : The Brisbane Walks For Water is Friday the 23 March, 2012 at noon (12:00 gmt +10). 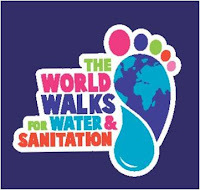 We are walking for water & sanitation. WHY? : So why is the world walking for water and sanitation in March 2012? Diarrhoeal diseases are the biggest killer of young children in Africa, killing more than HIV/AIDS, malaria and measles combined. Because of these global actions, governments are beginning to take notice, promises have been made, and there has been progress both internationally and within countries. This has encouraged hundreds of organisations and thousands of people to come together again in 2012 and keep up the pressure!